Undefeated Scottish welterweight Ross Houston believes that the Cage Warriors welterweight title will grant him a “golden ticket” to the UFC. Currently on a four-fight win streak with the promotion, Houston hopes to emulate the likes of Dan Hardy, Cathal Pendred, Pascal Krauss and Nicolas Dalby, who all were granted Octagon debuts on the back of their title-winning feats with Cage Warriors. 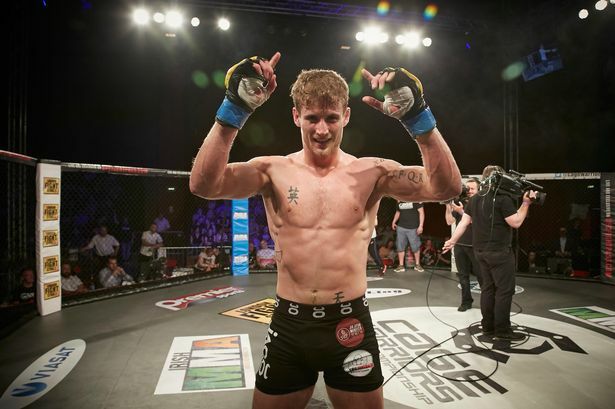 “The Hitman” takes on champion Stefano Paterno this weekend at Cage Warriors 98 in Birmingham and revealed that the buzz back home in Inverness is building for the title tussle. Houston highlighted that Saturday’s event will be a showcase of future Scottish MMA stars. Joining him on the card are Paull McBain, who takes on Aidan Lee in the semi-final of the promotion’s featherweight tournament, and Scott Malone, who is set to face Adam Amarasinghe in a bantamweight bout. “There’s a new wave of Scottish fighters coming through. We have reinforcements coming to help the guys who have been holding down the fort for years,” said Houston. “I had a few offers from a few different places, but I’m in a good position with Cage Warriors. I started in this sport to get to the UFC, not to make money. The way I look at it, I’ve got a title shot now and once you get that belt it’s the golden ticket to get into the UFC. I might have to defend [the title] a few times, but this is the direct route,” stated Houston. On the latest episode of Eurobash, MMA Fighting’s Peter Carroll chats with Irish journalist Niall McGrath about the latest MMA news from Europe. The Ross Houston interview begins at 24:45.